Yale University Press, 9780300205084, 552pp. 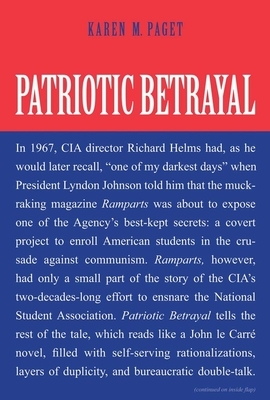 In 1967, CIA director Richard Helms had, as he would later recall, “one of my darkest days” when President Lyndon Johnson told him that the muckraking magazine Ramparts was about to expose one of the Agency’s best-kept secrets: a covert project to enroll American students in the crusade against communism. Ramparts, however, had only a small part of the story of the CIA’s two-decades-long effort to suborn the National Student Association. Patriotic Betrayal tells the rest of the tale, which reads like a John le Carré novel, filled with self-serving rationalizations, layers of duplicity, and bureaucratic double-talk. In this eye-opening book, Karen M. Paget, herself a former member of the NSA, mined hundreds of archival sources and declassified documents, and interviewed more than 150 people, to uncover precisely how the CIA turned the NSA into an intelligence asset during the Cold War, with students used—sometimes wittingly but usually unwittingly—as undercover agents inside America and abroad. A rich and suspenseful account of an under-examined episode in the Cold War, Patriotic Betrayal describes the relationship from its inception in 1947, when both the NSA and CIA were established, to 1967, when public exposure forced the CIA to discontinue the arrangement while successfully engineering a cover-up of the extent of its penetration into the NSA. For the first time, Paget tells the full story revealing that what began as a straightforward project to thwart perceived Soviet influence in America and abroad grew and diversified, and that intelligence-gathering and espionage—despite subsequent CIA denials—were integral to its nature. How did a domestic liberal student organization become, effectively, a covert arm of a secret government organization charged with advancing U.S. foreign policy aims? The answer throws a sharp light on the persistent argument, heard even today, about whether America’s national-security interests can be secured by skullduggery and deception. Patriotic Betrayal is an indispensable history of the dark side of Cold War good intentions and fills a significant gap in an important era of postwar twentieth-century history. Karen M. Paget, a former member of the National Student Association, is a contributing editor to The American Prospect and co-author of Running as a Woman: Gender and Power in American Politics..